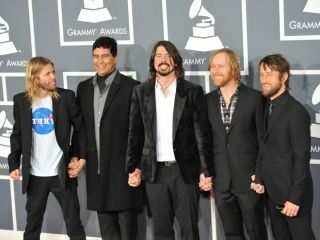 Foo Fighters scooped no less than five awards at last night's 54th Grammys. However, it was Dave Grohl's acceptance speech for Best Rock Album, reminding the crowd of the importance of music's "human element", that brought about a standing ovation. Check out an abridged version (we took out some of the record company back-slapping) of Grohl's Best Rock Album rallying call below. "To me this award means a lot because it shows that the human element of music is what's important. Singing into a microphone and learning to play an instrument and learning to do your craft, that's the most important thing for people to do. Among the Foo Fighters' sizeable haul from the night were Grammys for Best Rock Album 'Wasting Light', Best Rock Performance 'Walk', Best Hard Rock/Metal Performance 'White Limo' and Best Rock Song 'Walk'. Check out the full 54th Grammy Awards results report here. If Dave's got you inspired, you can learn one of the best riffs from 'Wasting Light' in our 'Rope' video lesson.